Costumes are something I can get behind. Halloween is probably my second favorite holiday and I put in my time on the attractions at Disney before I became a designer so, although I could never be that guy that runs to a Renaissance Fair or proudly introduces himself as a LARPer, it was a thrill to get the Civil War uniform on and slide into a different time. However, it wasn’t too long after that when I realized I was out of my league. I walked into the camp where period ground cloths were lined up against the wall of a barn for cover just as day was giving way to night. I carried on my back everything I would need for the rest of the weekend (which is to say, almost nothing). A cartridge box, bayonet, canteen, wool blanket, and a haversack with period cutlery and a rusting plate plus a lump of salted pork. Oh! And a gun. Before I even had time to stake my claim on a small portion of packed dirt beneath the barn’s overhang I was called to the side to run through a few drills and safety precautions with the Sergeant Major (who happened to be a descendant of R. L. Stevenson…one of the men indirectly responsible for the trip I’m on now) and one of the Corporals (who gamely helped me look like less of an idiot pretty regularly for the duration of the weekend). I ran through the commands for the gun positions (I’m sure there’s a better word for it) pretty quickly, faking understand as best I could, assuming that I would pick it all up as the weekend proceeded…I’m not sure I did. That first night quickly began to look as though it were going to be a strong contender for “Most Uncomfortable Night Ever.” Sadly, thanks to Amtrekker and a miserable mosquito infested camping trip circa 1990, it didn’t even rank in the top ten. Which isn’t a statement on how comfortable the evening became…more a statement on how many ridiculously uncomfortable nights I’ve had to power through in the last year (I’m talking to you San Diego), cause don’t get me wrong: That night sucked. There’s nothing quite like being in forty degree weather at three in the morning trying to decide whether you want frost bitten toes or all the heat to escape through your head. Based on the size of my standard issue blanket I’m going to go out on a limb and assume Civil War soldiers were several inches shorter than your friendly neighborhood Amtrekker. 4am brought with it a lot of chatter from the campfire as an unspoken unanimous decision was reached that sleep wasn’t going to happen. 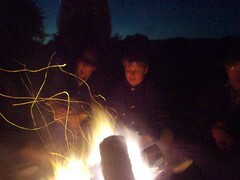 That’s about the time where I started weighing the merits of crawling INTO the fire. Better to be cold or singed? Worse case scenario I’m rushed to a toasty ER, right? Luckily, I’m a tough kid with just enough smarts to stick it out (although not quite enough smarts to keep me out of these situations to begin with). Daylight brought with it company drills and, by virtue of constant movement in wool uniforms, warmth. This is the part where the Corporal’s constant dedication to keeping me in line was most important to my own appearance as a capable human being (despite several instances pointing to the contrary). Eventually we ditched the camp and headed out for a tactical reenactment. (Read: Not a reenactment at all. More like paintball minus the paintballs.) This was one of the most satisfying episodes of the weekend. 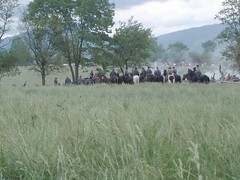 Our battalion started early and made our way through the woods all the way to the rear of the confederate army, jumping out from cover and firing into their unprotected backsides. As satisfying as that sounds it was also the source of my greatest frustration. This was a move that would have been devastating in a paintball match but since we were all just firing muskets filled with black powder and the other side gets to choose whether or not they feel like dying it was a less than impressive situation once the rebels decided it was in their best interest to just send the cavalry charging at us. It’s kind of imposing to have horses barreling down on you without any real recourse besides pointing a heavy period cap gun at them and screaming. Still, fun times none the less. I just don’t like not winning. And it doesn’t seem like the other team is playing fair when they just stand there and take an imaginary musket ball to the face. Conversely, it doesn’t give you much incentive to fall down either…and the cycle continues. There you go. That’s all the story time I can manage today and still get tomorrow’s podcast out in time. Thanks for checking in! Like what you read? Want to help buy a bigger wool blanket for next time? Click below! How sad is it that some people out there think your a weenie for making such a big deal out of 40 degree weather? Don’t you know that when you kill a guy you steal his blanket. Don’t you know that when you kill a guy you are supposed to steal his blanket. Wow…how did that happen? Glitchy pc….. Killing a guy and stealing his blanket? Well, yea, in the real Civil War that would be okay since it was brought by the US or CS Government but in the 21st century of re enacting, the re enactor has to purchase all his own equipment. This starts at $1,500 and the sky is the limit. I have been re enacting now for twenty-six years and there is a code of conduct / honor that we DO NOT take another re enactors equipment. So we’re all in agreement? Studmuffin is definitely plundering dead men’s gear. I am, however, enjoying the visual of grown men running around yelling BANG! BOOM! RATATAT! when they run out of powder – though for some reason when I picture it, you’re all dressed like french pantomimes… I wonder how frequently real fights break out when someone (likely burning hot on a belly full of NoDoz) simply refuses to die. I would be that guy. Is it taboo to proclaim your self an immortal god and streak through the battle wearing only a red cape? Try it. I 80% promise you won’t get shot. No, I don’t plunder other re enactor’s gear. My blanket and a forage cap is now with my nephew, trying to get him interested in re enacting. Yes, there are re enactors that refuse to die, those are normally in the “yahoo” category that don’t care about authenticity after getting a full volley at their ranks that would in real life, make most of the enemy fall down wounded or killed before the hit the ground. Most of the time, it’s not up to you decide when to die. It’s up to your officers who control the re enactors in same marching formations that were used in the 1860’s. They decide when people should “take a hit” and pretend to die. If you are doing outpost duty and not near an officer taking potshots at the enemy, normally you rely on your ammo to decide when you die. When you run out, you pretend to die. The enemy rolls over your position and then you get up after they have gone and return to your unit after the battle is over. You have to experience this, though in person to view what re enactors do. 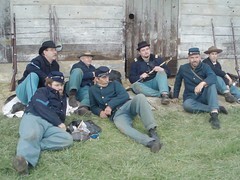 To find where a re enactment is in your area, I would consult the Civil War News or the Civil War Traveler websites.